There are lots of different hypotheses about what fingerprints could mean. And lots of different interpretations of these different theories too. Some medical researchers relate the differences in pattern to chemical conditions in the womb. However, identical twins, with identical DNA, who experienced identical womb chemistry, surprisingly do NOT have identical fingerprints. Prior to Richard Unger, nearly all palmistry interpretations of fingerprints based their work on Noel Jaquin’s work which correlates types of fingerprints with personality characteristics. The exception is Richard Unger’s LifePrints system which proposes a pattern linked to who we are beyond personality, in other words, our soul psychology. In this article it is not my intention to compare different systems. It is an attempt to end misconceptions about what LifePrints is exploring and why so many people find it useful on so many different levels. Fingerprints start forming once the volar pads that contain them are formed, 13 weeks after conception. They are completely formed by 21 weeks. How can they inform us? It helps to think of fingerprints as patterns in nature. Just as wind leaves a pattern in sand, and we can study the sand patterns to determine, for example, which direction the wind blew from and how hard, so too our fingerprints are evidence of an energetic force beyond and preceding our body, personality and life experiences. 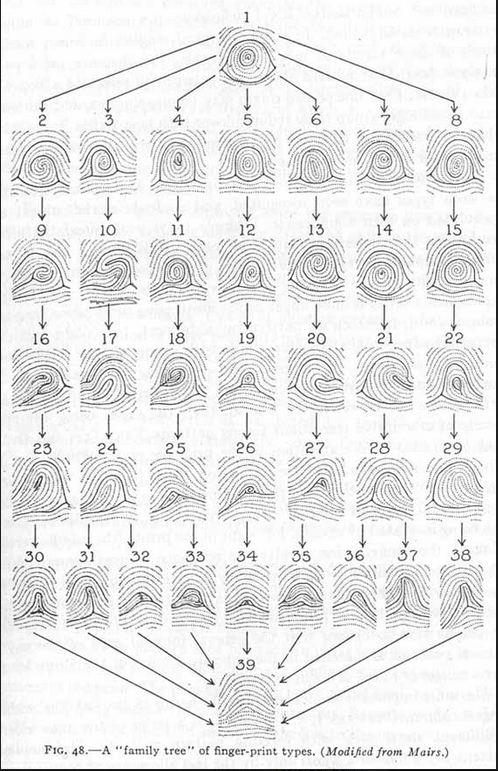 On the left there’s a chart from early fingerprint researchers attempting to classify fingerprints according to pattern intensity. This chart is useful because it helps us get a quick glimpse of what we are trying to measure – variations in pattern intensity. At the bottom of the chart, is the arch fingerprint pattern. This fingerprint pattern has the lowest pattern intensity. At the top, is the whorl, with maximum pattern intensity. In the LifePrints system, rather than focusing on exact finger print type we are looking instead for differences in pattern intensity across the 10 fingerprints (and also in the palm). More importantly, we are looking for which finger/s have the lowest pattern intensity, and which fingers have the highest intensity. Therefore questions such as, “is that a whorl or is that a peacock?” are not really the issue in this system. We are looking more for differences (pattern variation) and we are trying to identify the location of the highs and the lows. (Which specific finger/s?) Therefore, a more appropriate question to ask is “How does one fingerprint look compared to the other fingerprints?” Are they all the same or is there a variation? Which are more complex and which are less? And, if so, where are these fingerprints located? Pattern perfection is another factor. If all 10 prints are the same type type, for example, all 10 prints are whorls, then the question becomes, is one fingerprint more dominant or more central on the pad or more perfect in form or less so than the others? Again, on which specific finger is this “higher” or “lower” ranked print located? Why is location important? Instead of exploring personality characteristics, the LifePrints system explores our hidden drives or soul psychology: what issues or life themes are we exploring? What are the theme extremes or polarities that drive us? Greek and Roman mythology has explored these themes over the millennia, and, more importantly, these mythological archetypes are represented on the hand. 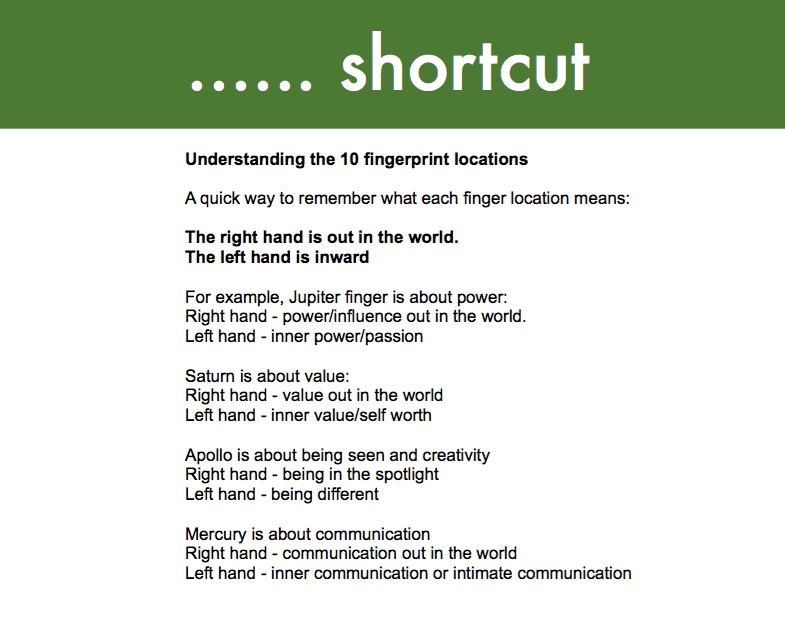 For example, the index finger refers to Jupiter/Zeus themes (power themes), the middle finger Saturn/Cronus themes (value), the ring finger Apollo themes (issues related to being seen) and the little finger relates to finger Mercury/Hermes themes (communication). 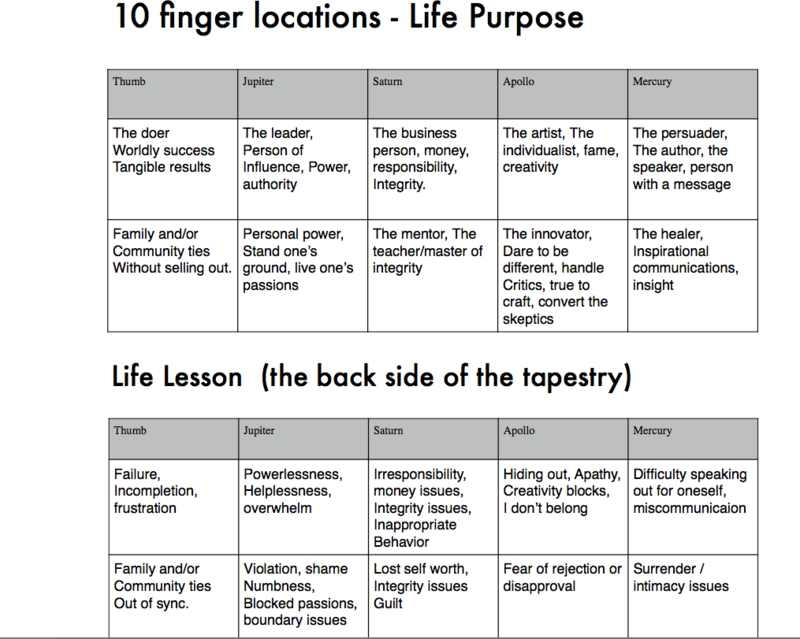 This article is just a very rough and brief guideline by me to help people understand that the LifePrints system is looking at life themes and core issues that we are driven to explore rather than at personality characteristics. Fingerprints answer soul psychology questions such as: What issues drive me? What makes me feel deeply fulfilled? (life purpose) or what issues trigger me or what causes me to contract? (Life Lesson). Knowing this (being conscious of what causes you to lose energy/contract, and conscious of when this is happening (how this feels in your body and how let go of contracting thoughts) enables people to make rapid progress in personal development. This is a completely separate variable to personality. To reiterate, unlike other fingerprint systems, the Lifeprints system does not attempt to determine personality characteristics from fingerprints, instead hand shape is used an extremely reliable indicator of personality. (available through your local bookstore or online.) 280 pages, or download the more complete version, +500 pages LifePrints Deluxe. which is more than 200 pages longer and includes an appendix covering Richard’s thoughts on other systems. Here is a 20 page extract from LifePrints Deluxe Appendix II: Fingerprint History and Research freely accessible here with permission from Richard Unger. Richard’s work is of huge significance to psychologists and other mental health practitioners because it helps them become conscious of what triggers a person/what mental program they are running. Therefore, instead of labeling a behavior, and thereby reinforcing it, they can simply identify it as something to master rather than fix. It can’t be fixed because there is nothing to fix. Just as you can’t fix a computer program by running the same program over and over. The solution is not to fix the program but to learn how to use the program intelligently. In other words, in this case, to learn self mastery. The “39 Steps” to living on purpose and numerous other soul tracking classes. There’s also a course available that relates this thesis back other metaphysical teachings and principles – more information about this course here. This is a helpful article, Jena, particularly your explanation about looking for intensity and differences from one fingerprint to the next. I have six whorls, which are not all identical. How to I tell which one (or ones) are have more intensity? Three (left mercury, right apollo & mercury) are very bullseye-like. One (right mercury) looks like there is a tiny loop in the center of the bullseye. One (right thumb) looks very spiral-like in the center, while the left thumb looks like a yin-yang in the center. [Life lesson is right jupiter - a tented arch.] Thank you! Hi Kim, as I said before, when there are several similar ones you look for the the most perfect. But what I left out of the article is that there are a number of recurring patterns of location that Richard calls “common combos” (common combinations). In your case it is successful Public Impact in the healing arts (PIHA). The left thumb is a composite whorl. This means family (left thumb) is on and off if you aren’t paying attention to Jupiter issues (power issues/standing in your own power.) Self compassion when you are dealing with Jupiter stuff is what unlocks your PIHA purpose. Right Apollo + Left Mercury is already enough. Thank you! Very helpful…as always! As you know, it depends on what is on the other fingerprints. A composite whorl in the center of a peacock? Yes, that could become part of the issue if one doesn’t pay attention to whatever the lesson is. Maybe you should email me the prints so I can comment.